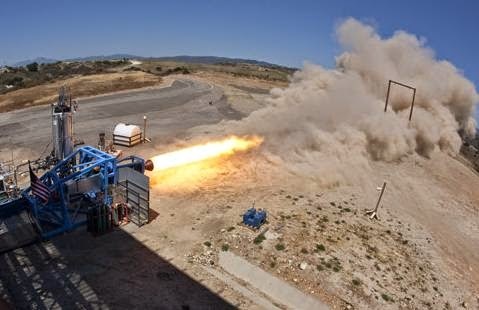 NASA’s Peregrine Hybrid Sounding Rocket motor was hot-fire tested at Ames Research Center on Nov. 12, 2013. It uses paraffin-based fuel and nitrous oxide as the oxidizer for highly efficient combustion. Liquid nitrogen floats on the top of the warm water, expanding thus propelling the soda bottle upwards with extreme force.